I love pomegranate (remember the pomegranate chicken?) and I’ve been desperate to experiment with recipes for this Christmas. So stumbling across this recipe from the BBC Good Food Christmas magazine was a bit of a blessing, really. You need cranberry sauce with turkey. 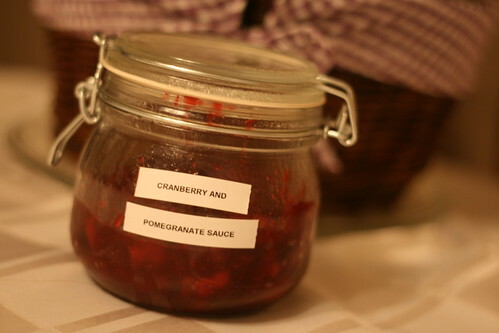 This is just cranberry sauce with a gorgeous hint of pomegranate. You can either make it two days before Christmas or you can make it three months before and freeze it. I’ve gone for the freezing option, but the taste I had of it was…mmm. If you were feeling particularly good, you could give this away as a Christmas gift. Anyway, enough of that. Here’s how I made it. As well as being delicious, this recipe is super simple. All you have to do is tip all of the ingredients into a pan and mix well to combine. Put over a high heat until it boils. 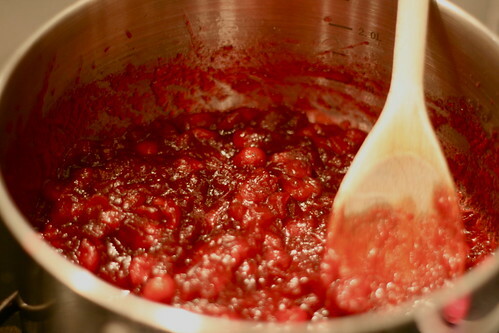 Then reduce the heat and simmer until the cranberries start popping, which should be about five minutes. 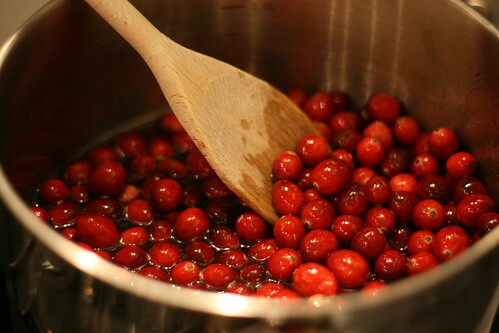 Stir like a madwoman whilst the cranberries turn into a lovely, runny sauce. Take it off the heat, leave it to cool and pop it in a jar. Lovely!